The best bat for a 6 year old? If we were forced to choose, we’d take the less expensive 25/15 Drop 10 Easton S3 2 5/8 Junior Big Barrel Bat. bat over a more advanced two piece composite like the JBB DeMarini CF Zen. It’s not that we don’t love the JBB CF Zen. Indeed it is one of our favorites. But justifying the price difference for a bat that won’t be used much is a push. And, to boot, the S3 has a great balance and feel for players that need as much help swinging the bat as possible. In terms of sizing, check our bat size chart. But, the average 6 year old should swing in the range of a 13 to 16 ounce bat. If you are looking for the best overall bat for a 6-year-old, we recommend the Easton MAKO Beast JBB in a 25, 26 or even a 27-inch length. These JBB’s come in a drop 12, meaning the 26 inch bat will weigh just 14 ounces, the 27 will weigh 15 ounces and the 28 will weigh 16 ounces. It will provide plenty of barrel and a light swing for the 6-year-old. Junior Big Barrel bats are not rated for pitch speeds above 45 miles per hour. Although we’ve seen the JBB Easton Beast perform at pitch speeds above that, do note that maximum pop and distance are not equivalent to bats made to perform at faster speeds. See our Easton MAKO Beast Review. The Jennie Finch T-ball Softball Bat in a drop 13 is a perfect fit for a serious 6-year-old in fastpitch. Its shortest is a 26 inch that runs 13 ounces. As a single piece aluminum, expect a remarkably light swing rated for very slow pitching. But, it will work. And at something less than $40 its is a great value buy, too. General reviews are positive in terms of durability and a value purchase. See our best fastpitch bats article. USA Bats, for the 2018 class, lack significantly in LIGHT swinging bats. Even this threat, easily the lightest swing you can find in performance bats for USA, only comes in a 28 inch. And, as a drop 12, the 16 ounce bat is likely too heavy for most 6 year olds. But, still, we like the bat if you child can swing it. If you do need a USA Bat and want to stay in the performance space then the Threat is the right answer. Otherwise, look for a tee ball USA Bat to hold you over until they are big enough to get in on the goods. (Or, better yet, the industry gets their act together and starts making smaller USA bats). See our Rawlings Threat Review. As we write in every ‘best tee ball bat’ article we’ve ever put out there, we are big fans of the axe handled bat in the tee ball space. We think the more ergonomic handle forces better mechanics. And a focus on mechanics at age 6 is a great thing. Axe bats makes these bats exclusively. Their line of tee ball bats is referred to as the HERO. It is easily our most favorite t-ball bat on the market. The bat comes in very tiny sizes and a drop 11. Best yet, the bat is usually found for less than $30 in a number of places. Question 1: What bats are allowed in his or her league? 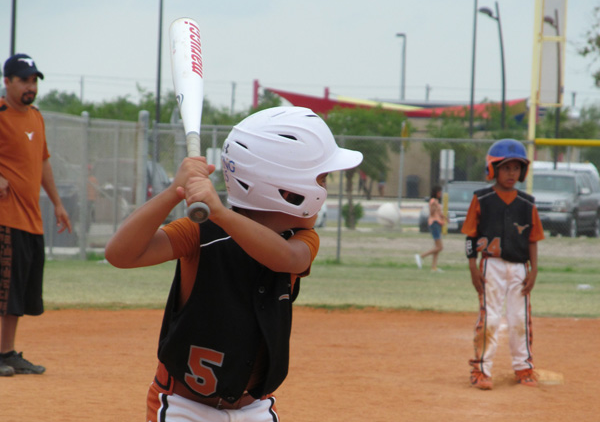 Few 6-year-old leagues have actual restrictions on bats. In fact, many of the Junior Big Barrel bats on the market are not rated for anything. Nor are tee-ball bats, generally speaking. These bats are built much more for a light swing than they are for wild performance. That said, however, you should make sure there are no particular bat restrictions for the league you are playing in. Some, we have heard, don’t allow certain weight drops or 2 1/4 barrels. Most are anything goes. Check with your local league director or coach. Question 2: How much money do you want to spend? Pricing for bats, you may already know, can be ridiculous. There are some Junior Big Barrel bats pushing $250 while many others in the 6-year-old tee ball space are not much more than $20. Our general rule for bat budget is the “Rule of 7”. That is, take the number of games the child is playing and multiply it by $7.00. Do not spend more than that. Question 3: What size bat does he or she need? Bat sizing at age six should not be difficult. Few are really hitting for serious distance. We do have an honest bat sizing chart worth reviewing if you are ultra-concerned about the right size. For 6-year-old kids, lighter is almost always better. Bat speed and bat control will mean much more for on base percentage than barrel size and weight distribution. Many bats come in weights as low as 11 and 12 ounces. Some Junior Big Barrel bats are as heavy as 15 or 16 ounces. When in doubt, choose the lighter swing. Question 4: What about USA Bats? Some leagues, even as young as 6, require the USA Bat stamp on their bats. If that is you, then make sure you look under the USA bat section of major retailers. We have a list of our favorite USA Bats here.